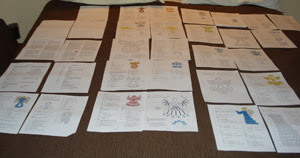 Yesterday's project was to spread out all the patterns to decide on the sequence for the book pages. Before the day was over, I changed my mind again. Twice. I see lots of tweaking that needs to be done, but it's getting closer bit by bit. I didn't drop out -- I've just been very busy. Mostly it just stays crumpled in its little bag, but once in a while it gets to come out and play. This was 2 weeks ago. 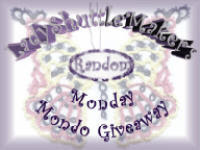 Why can't I get around to blogging? Gah. On a bright note, I picked my first tomato of the season yesterday. It got to sit on the kitchen counter and be admired and fondled, and today I will have a tomato sandwich. Tomato sandwiches, it's a Southern thing. Some of you have asked, yes the new book is all angels. "A Flight of Angels" is the tentative title. Here's another sample. 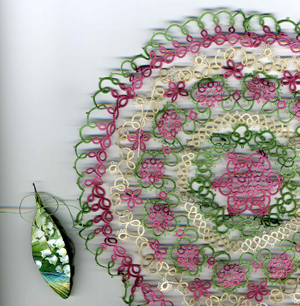 This one needs to go back on the blocking board before I re-scan it and make the diagram. That wing raised up as if to wave is cute, but I want the diagram to be more symmetrical. 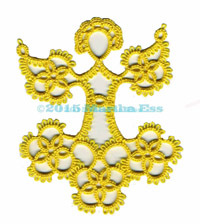 Interestingly, Iris recently posted about all the difficult steps in writing a tatting book. You can read what she has to say here. I don't have quite so many steps perhaps, but it is still very time consuming. For example, I had 7 patterns I thought were done, but then I had to go back and fix the diagrams on every one. That means go to Serif Draw and change the diagram and export as PDF. Then open in Photoshop to crop. Then go to the pattern in Word and insert the new picture, update its text wrapping setting and resize till it fits on the page like the old one. There may be easier ways, but I'm self taught, so these are the methods I've stumbled onto. I've been overwhelmed with family matters lately, but I'm starting to see the light at the end of the tunnel, I think. In fact, things are looking up to the extent that I think I can finish a new book in time for the Palmetto convention after all. Here is one of the patterns I've been working on.